NICE is a mod about decoration. It adds a number of fancy glass like blocks (cylinders and cube for now) that can be filled with four types of particle systems. This is the first version of the mod. More decorations are planned in the future. 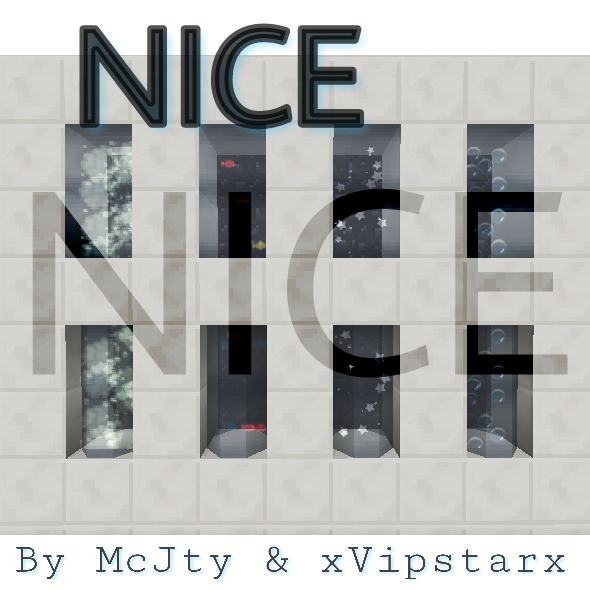 This mod is a cooperation between McJty and xVipstarx who does the artistic design. Currently the mod has two blocks: a particle cylinder and a particle block. Each of those has two variants. A green and a blue one. You can craft these and place them in the world. To assign particles you can use wool (for smoke), diamond (for sparkles), water bucket (for bubbles), and fish (for fish). As said before, many more effects are planned. I can't figure out how to change the particles. Any help would be greatly appreciated. I got it. Lol. My bad. Suggestion: Allow changing of particle colors with dyes, e.g. ink sacs to make smoke black. I would like a transparent version too though, where there's no colour to the block but the particles are still visible. Just cause I can imagine that would look good. he is probably using the 1.10 version, as many people still do. If player A changes the effect of the particles (say from Smoke to Sparkle), and player B is in the area rendering that block. Player B will crash. The change that A makes isn't detected by B player correctly. So server to client issue, tho the client crashes. This bug has been fixed ? Whaaaaaa, How did I not notice this! It is so NICE! can we get some screenshots guys?